Marion, Iowa. Dec. 4. - 1923. The Cary Club met with our President, Mrs Bailey, who called the meeting to order and fourteen members gave Proverbs in response to roll call. Minutes were read and approved. 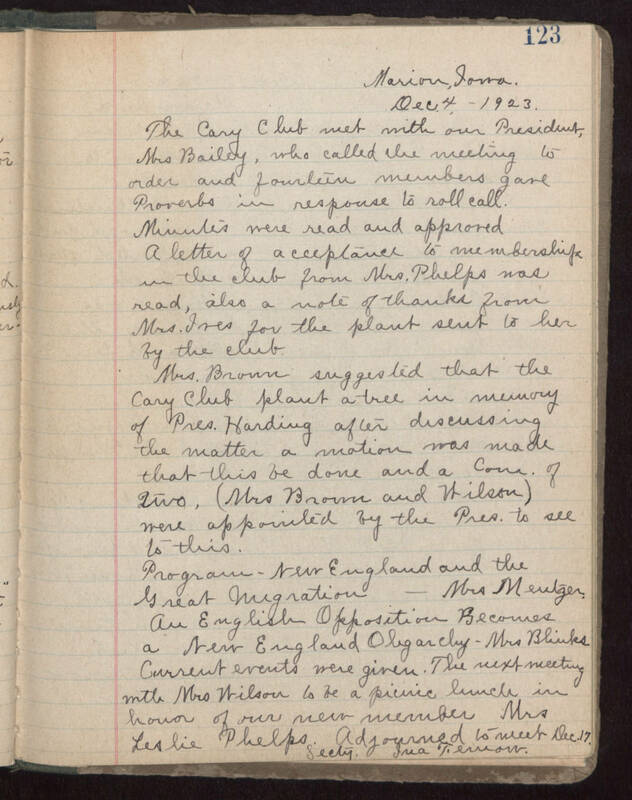 A letter of acceptance to membership in the club from Mrs. Phelps was read, also a not of thanks from Mrs Ives for the plant sent to her by the club. Mrs. Brown suggested that the Cary Club plant a tree in memory of Pres. Harding after discussing the matter a motion was made that this be done and a Com. of two, (Mrs. Brown and Wilson) were appointed by the Pres. to see to this. Program - New England and the Great Migration - Mrs Meutzer. An English Oppositions Becomes a New England Oligarchy - Mrs Blinks. Current Events were given. The next meeting with Mrs Milson to be a picnic lunch in honor of our noew member Mrs Leslie Phelps. Adjourned to meet Dec. 17. Secty. Ina Temow.